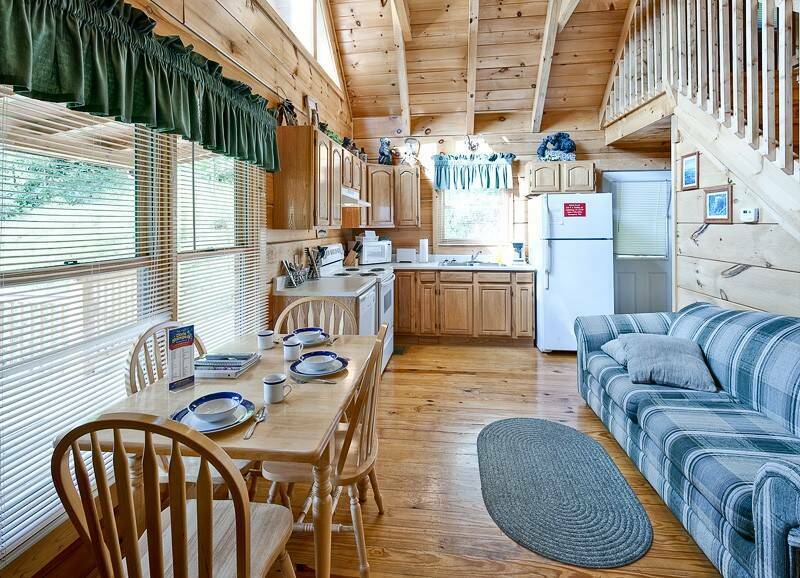 Sugar Shack is a Two Bedroom Cabin priced as a one Bedroom. 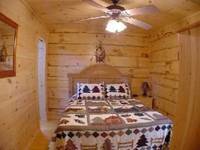 It is constructed Traditional Square Plank Log cabin, with exposed beams and soaring ceilings. Relax in the nearly 1200 sq. 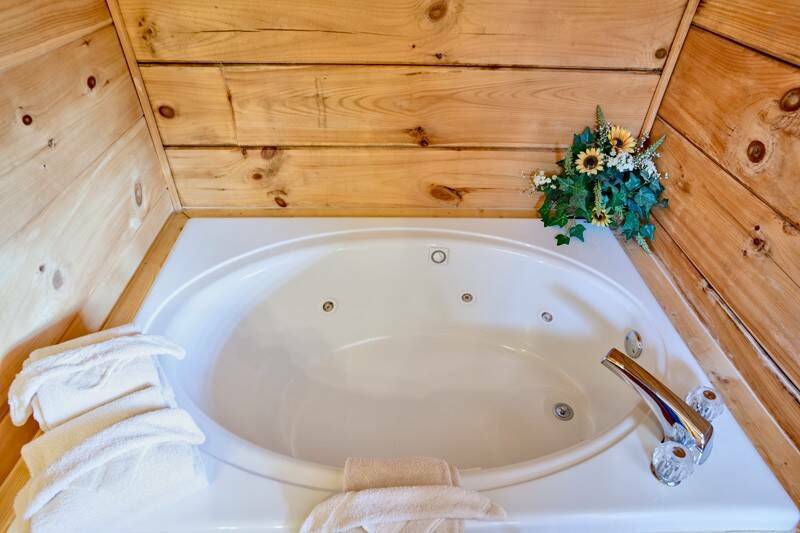 ft. cabin with beautiful wood interior, gas fireplace, and indoor jetted tub. 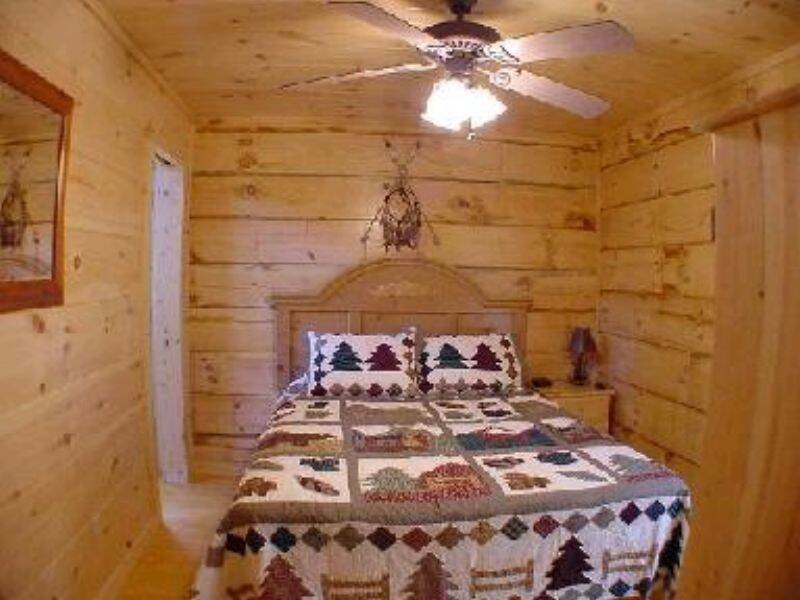 Sugar Shack will make a perfect start for a great Smoky Mountain vacation or a romantic getaway. Settle in by the fire on a winter's evening watching a favorite movie on DVD or VHS or challenge friends and family to a game of pool in the game room. 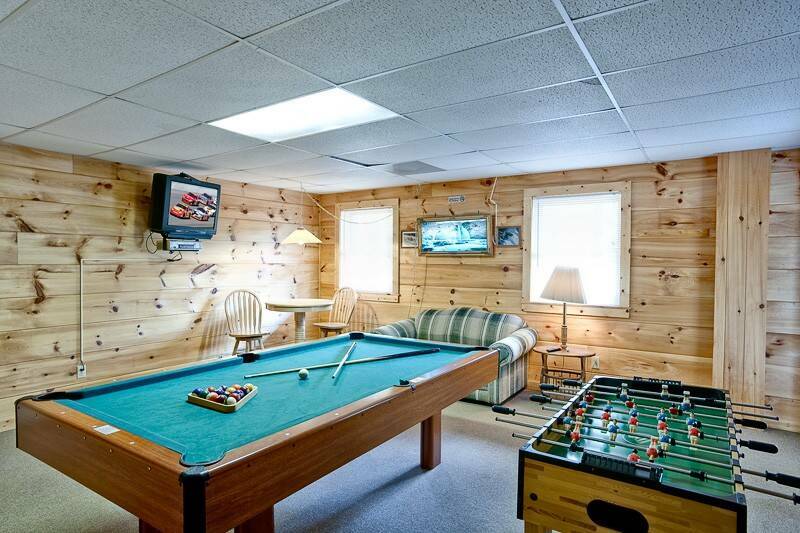 The game room is located on the bottom level of the cabin and has a separate entrance. 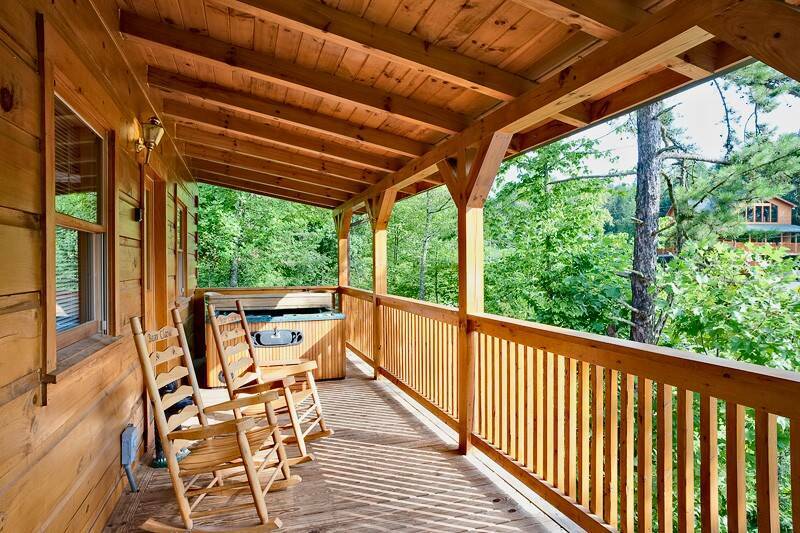 Unwind in the warm bubbling hot tub on the wrap around covered deck. 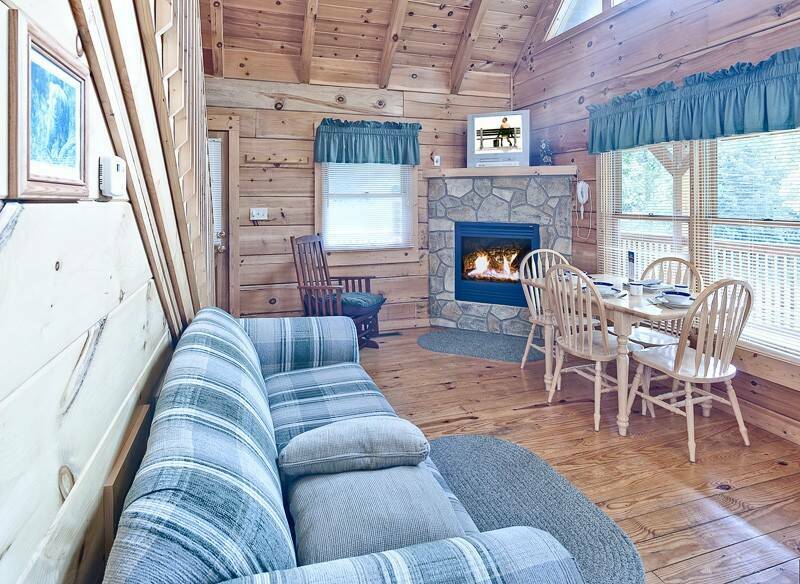 Sugar Shack Cabin offers local channels, sports, Disney and many more channels. cabin was clean and comfortable, staff was very accomadating and helpful. We loved how quiet the area was since downtown was so crazy. It was nice to come back after a long day and relax on the porch and not have all the downtown noise. My daughter loved the game room. We thoroughly enjoyed our stay in the Sugar Shack. It was beautiful inside and out and very comfortable! 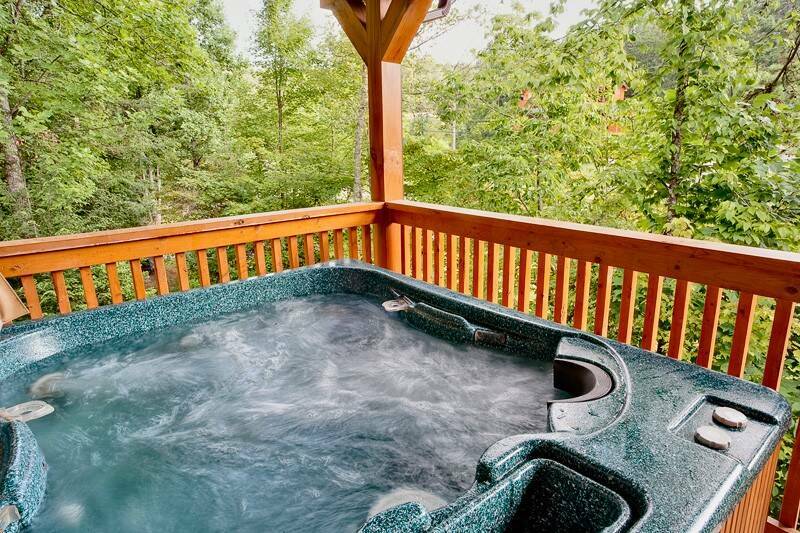 Easy to get to and close to many attractions in Gatlinburg and Pidgeon Forge! The cabin was everything we had hoped for! The location was different then we usually stay in, but the directions given were very easy to follow! Thanks for an awesome much needed vacation! I couldn’t have been happier with our stay. It was in a good location for us and it had everything we needed. The cabin was comfortable and well maintained. The only warning I would give is that there is NO WiFi and our AT&T phones did not get service at the cabin either. The landline phone in the cabin worked though. Thank you Heartland for a great vacation. We had an amazing time. Our cabin was beautiful. The staff were great and very informative. Me encanto el personal que alli labora, son muy atentas y super amables!...estuvieron pendiente de mi en todo momento y cualquier ayuda que les ped�a inmediatamente me respond�an! Excellent prompt response and repair of air conditioner. Otherwise everything was good. Will return again. We enjoyed our 3-night stay. The cabin had everything we needed, except a grill brush, and it was a very enjoyable stay. We enjoyed the hot tub and played pool in the evenings. Our two-year old loved the cabin just as much as we did. This was our first time renting a cabin and we had an awesome experience. Quiet but close to the action in downtown Gatlinburg! Location was great, near shopping area, friendly people & weather was great. Really enjoyed our time at Sugar shack. Will definitely return!! Thanks, for awesome time & hospitality. The cabin was very comfortable for the two of us. The location was close enough to Gatlinburg for shopping and dining experiences, but far enough away to avoid the crowds and traffic. This cabin was just the right size for a family of 4. Many reviews here list "no cell service or internet". This is true, however I don't see that as a negative at all. At no point during my vacation could my work wake me with a call. It was wonderful. And besides, if you really need cell service, just a short walk up the road provides it. Heartland staff very good to work with but we just choose the wrong cabin for our needs. We did not have cell service nor did we have any Wi-Fi service. A peaceful, relaxing place to rest and re-energerize. We loved the cabin. It was nice and clean, quiet and peaceful. Just what we were looking for. We loved the hot tub. The only thing we didn't like was no internet connection. But, that was good to make us totally "unhook" from the world for a few days. 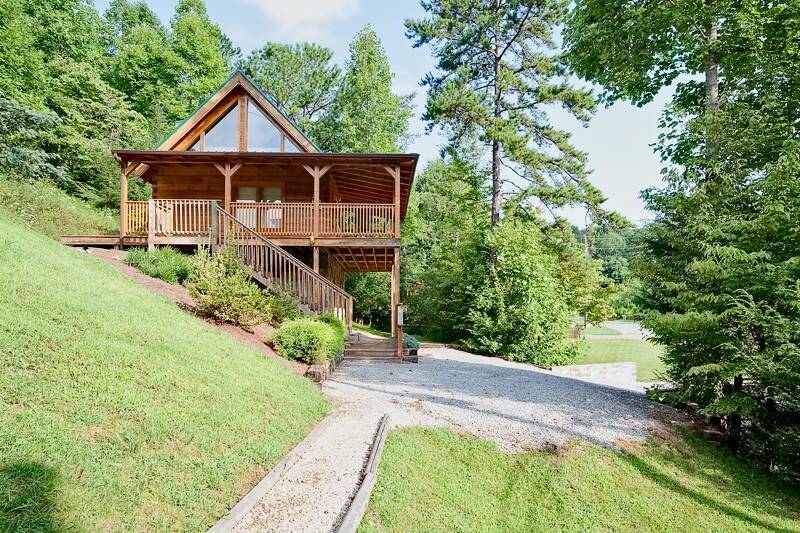 We would definitely recommend this cabin to anyone wanting to get away. Thanks for the great vacation. This was my first time ever in a cabin. I'm so impressed! The beds were super comfy, nice hot tub, the game room was fun. Everything was provided down to the the pots and pans. 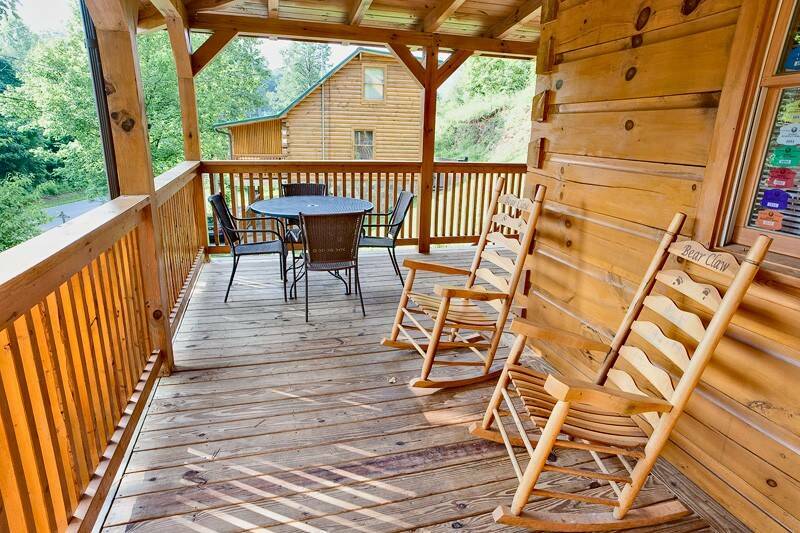 The best part of the cabin is relaxing on the porch in the rocking chairs. We had a very lovely stay recently at the Sugar Shack! Our only complaints would be that there was no grill brush and our jacuzzi did not work! Other than that we would definitely consider renting the Sugar Shack again! Would have received five stars if they had wifi & sports networks to watch playoffs at cabin, otherwise it was a great location just minutes away from everything. My wife and I stayed here for a few days for our honeymoon and absolutely loved it. We will definitely be back in Gatlinburg with heartland. We have stayed with Heartland Rentals for years. Staff friendly, cabins are nice. If there are problems staff handles them right away. We stayed at the Sugar Shack with Heartland rentals for our honeymoon. We had the best experience ever! 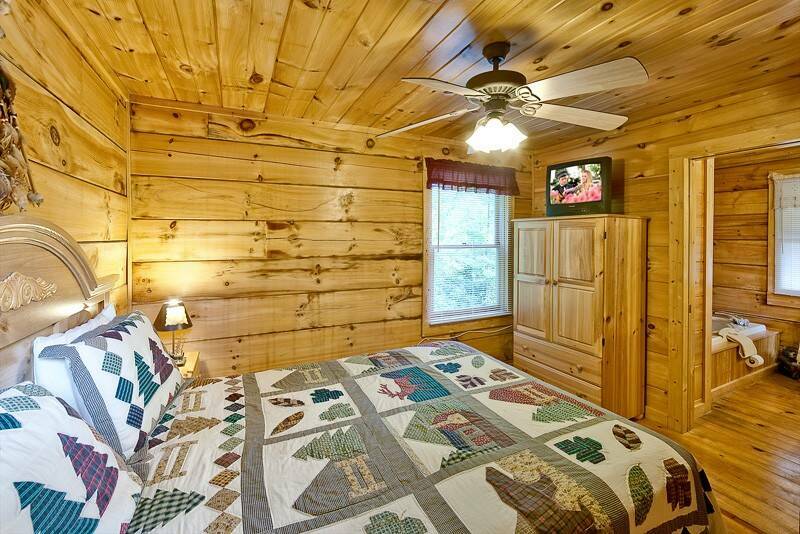 The cabin was the cutest, cleanest and perfectly located. The staff was very friendly and helpful too! We will totally be back for our anniversary and a family trip as well. Everything was great! It was a nice cabin and when we come back will probably stay at the same cabin again. Overall we were pleased with the cabin. The cabin was clean and we appreciated relaxing in the hot tub after a day of hiking. It was a very relaxing and romantic stay for me and my fianc�. The staff at Heartland Rentals was very helpful and nice. We didn't get to stay in our cabin we chose due to the whether. We could not make it up the icy moutain but the staff did find us a cabin we could get to safely. We enjoyed our stay and will be renting through Heartland in the future. The cabin was great, just as we expected, it looks the same as the pictures. Everything was very detailed and clean. We wanted to have more time to enjoy but had to get back home. It was great, everyone had a blast! !